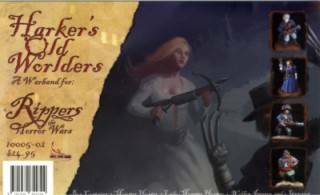 Rippers boxed sets contain some of the miniatures previously released under West Wind Productions Gothic Horror ?Vampire Wars? label, these sets are boxed in a sturdy plastic foam filled case for storing your painted miniatures. This set includes: Monster Hunter, Lady Monster Hunter, 4 Wolfen Jaegers, and 4 Gypsies (11 figures).